I bet you’re looking at that picture and wondering how I got here, with a tattoo of Danny DeVito as a Dorito on my thigh. This whole thing started in 2016. I’d just watched one of Danny DeVito’s shows, “It’s Always Sunny in Philadelphia,” for the first time on Netflix, a show I had been meaning to watch for a long time. I loved it. It’s a fantastic show if you’ve never seen it. I can’t recommend it enough. 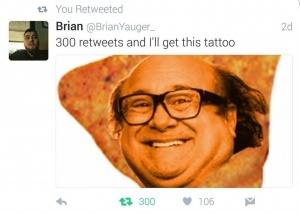 In the midst of watching, I came across a picture of Danny DeVito Photoshopped on a stock image of a Dorito. 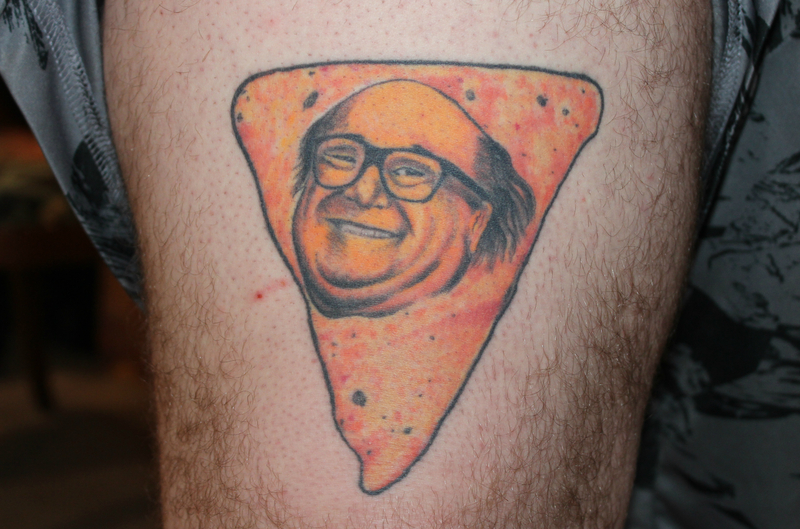 Danny Dorito. I thought it was hilarious. Yes. Just 300. I thought that it was late enough at night, only a few people would see it and then it would blow over. Everyone would forget about it. After a day or so, only a couple people retweeted it, exactly what I expected. Then my notifications suddenly started blowing up. Conor Galvin, a writer from “It’s Always Sunny in Philadelphia,” had found my tweet and the ensuing chaos unfolded. An hour after Galvin retweeted it, my original post reached 300 total retweets. It’s a promise I had to own up to. Many would slink away from paying their dues, but I’m a man of my word. For better or worse. I’d searched for a few months for a tattoo shop that would give me the best product for the best price. I decided on DNA Studios. Yes, that DNA Studios. This was when they were still located in Warren. Dennis Kirsch, now with The Tree House Tattoo Studio, was the artist behind the Dorito. Roy Schmidt, owner of DNA Studios, was in attendance for the whole thing. Amber Slick, who is tattooing at The Tree House Tattoo Studio with Kirsch, was also in attendance for the incident. Slick continued on to give her thoughts about the outcome of my little Dorito adventure. “I thought it came out fantastic in the end, and thought you took it relatively well for your first tattoo,” Slick said. I know what you’re probably thinking, “Why would his mom let him do something so stupid?” I’ll let her explain that. To this day, she still doesn’t know why I did it, but she’s cool with it so I won’t explain. So, the lesson of the story isn’t what you think it is. It’s not that you shouldn’t post a retweet bet on Twitter with such a low bar. It’s not that you should run out and have Danny DeVito’s face permanently etched on your body. It’s that you shouldn’t be afraid to do something crazy while you’re young. They say life is short, so I say have fun with it while your body still lets you. I tried reaching out to Danny DeVito on Twitter to comment on this whole tale, but he’s too busy posting pictures of his feet.